This is a remarkably easy, wonderful cobbler. This is one of those recipes you can use to get your kids to learn how to cook. It isn’t overly sweet. 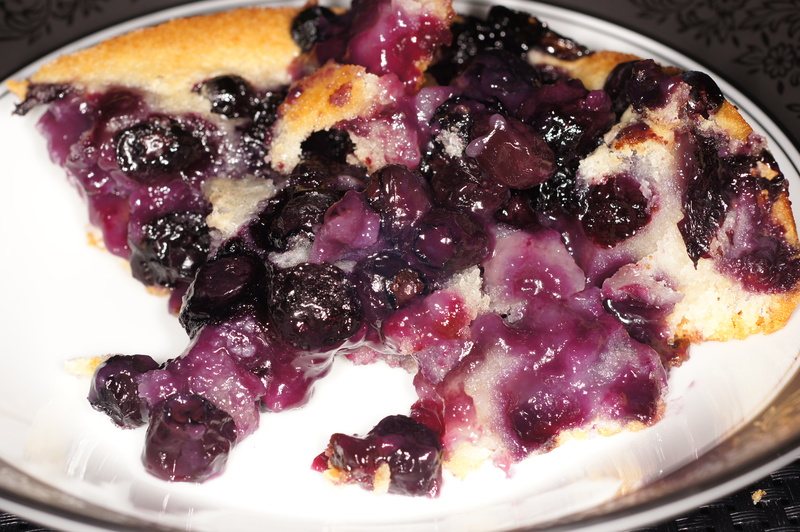 You get the full flavor of the blueberries and a nice cakey texture. Your kids will love it. You will, too. Baby Lady periodically tells me she doesn’t cook. Of course, most meals and menus we fix are a collaboration. We discuss the night’s meal and figure out what we want to do. She always cooks at least one thing. Most of the entrees, however, I do prepare. Last night Baby Lady decided she would give me the night off. I have been very busy of late and am leaving town for depositions next week. Baby Lady decided I should spend my time working so she could cook. Of course, she did this under the guise of her trying to help with my work schedule but I know better. Baby Lady wanted to cook last night’s dinner all by herself. It was a wonderful meal even if I wasn’t involved. Crumble — a British dessert in which raw fruit is topped with a crumbly pastry mixture and baked. It is similar to a crisp, but not as rich. 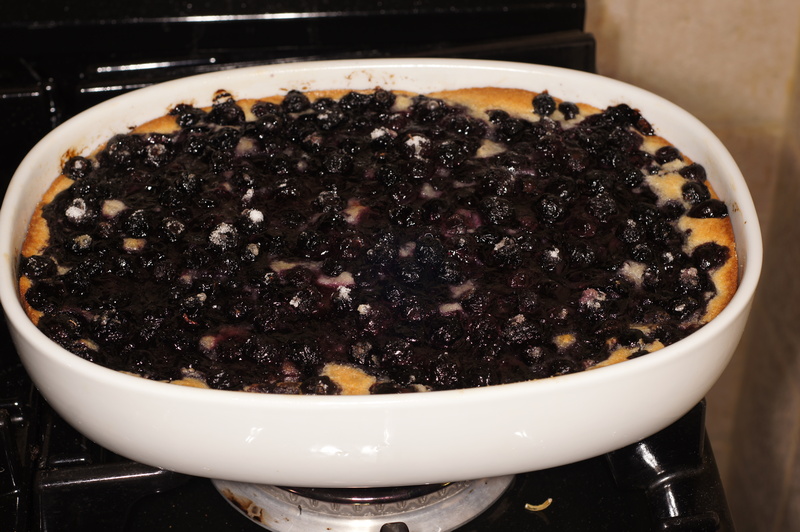 Slump — a spoon pie, including cooked or uncooked fruit topped with biscuit dough or piecrust, which can be baked or steamed, and can be made upside down. Dump Cake, a spoon pie, kinda sorta, using canned fruit, juices and all, dry cake mix sprinkled on top with butter pats on top of that which is baked. Baby Lady’s creation is a cross between a dump cake and a cobbler. Rather than getting doughy biscuits with sugary fruit, you get a cakey texture and sweetness coupled with the natural flavor and sweetness of the fruit. Butter a 11 X 9 baking dish. Mix the flour, sugar and milk in a bowl and pour into the buttered baking dish. Add the blueberries. Place in a 350 F preheated oven and bake for 70 minutes or until done and the cake is golden brown. Remove from oven and allow to cool. Serve and enjoy! I make a peach cobbler similar to this one. They’re so very easy to assemble that one can have a tasty fruit cobbler within minutes if there’s fruit available. Thanks, John. Cobblers are amazingly easy and this one was delicious. I make the same cobbler! I love to make it with apples, and I might try this week with some pineapple. Thanks for your comment. We love apples and need to try it with apples. Wow you weren’t kidding when you said this was easy. I love easy! Yep. Super simple and incredibly good! This cobbler looks really good, Can you make it using canned pie filling? Thanks! Nope. Canned pie filling would be too wet.